The game has changed in the world of makeup once again, Millennials. You might have noticed that the natural looking makeup is now at its peak. Thanks to Beyonce and the Kardashian klan, women all over the globe is saying hello to more subtle colors and hues. I love this trend because I love to wear makeup all around the clock, but you can’t really wear too much makeup if you are going grocery shopping or to work without having your peers thinking that you are trying way too hard. But with this new natural looking trend, it can bring out your natural beauty without having to do too much. With this trend in the forefront of my mind, here are six of my favorite e.l.f. products that I use almost daily in order to achieve my favorite natural look without breaking the bank. My first favorite e.l.f. product is the e.l.f. Illuminating Palette. It has four beautiful colors that complement each other stunningly! I love this palette in particular because you can easily mix and match to make your own perfectly blended shades. These soft focus colors are great for illuminating around your eyes and your cheekbones that can leave your face looking radiant. I love using this palette as one of the last steps in my makeup routine so that the colors won’t be muddled with my foundation (I use a liquid based foundation so I have to allow it to dry before applying any powder). You can find this palette here. In order to get the perfect natural look, you, of course, will need the perfect natural colors. This is where the e.l.f. Prism Eyeshadow comes in. Because of the creamy texture of these shadows, the colors can be used for contouring and highlighting as well as leaving your face looking smooth and flawless. I really like these eyeshadows because there are shades for almost every skin color. You can find this little beauty here. I live for this lipstick. Seriously, this e.l.f. Moisturizing Lipstick is perfect for finishing up any look with the added benefit of keeping your lips perfectly moisturized because it is enriched with shea and vitamins A, C, & E. Perfect for these freezing cold months coming up. And don’t worry, the rich and creamy formula seals in moisture for long-lasting wear. Other than keeping my lips nice and healthy, these lipstick comes in a ton of different colors that can work for any look that you are trying to accomplish. And at only $3 a pop, you can be the owner of all of them! You can find them here. This is the perfect thing for those who would like to change up their lip color more than once in a day. When you want to take your daytime look to an evening look, the e.l.f. Kiss It Goodbye Lip Color Remover is great for on the go. Like the moisturizing lipstick above, it also moisturizes while it works. It is packed with Safflower Oil, Jojoba Oil, and Aloe so the winter months will not leave your lips dry and cracked. I have a bit of a guilty secret: After a late night out, sometimes I am way too tired to wash my whole face with soap and water. This color remover is great for those nights to get your lipstick off quickly. You can find this here. Finding the perfect eyeliner is tricky. You have to find the right consistency and size of the brush for the perfect, slight wing that I love to have. Well, I don’t have to look any further because this is it! The e.l.f. Precision Liquid Eyeliner glides on smoothly for precise and defined lines. No longer will I have to stand in front of my mirror trying over and over again because my eyeliner is not right. I love that the brush is slightly tapered so that extra flick at the end of creating the winged eyeliner look is not necessarily needed anymore. You can find this here. My dear, dear blotting papers. I don’t really need them in the winter, but the summers are harsh here in the D.C. area so they are quite handy to have. The case is portable and reusable that also has a little mirror. It comes with and applicator sponge with 8 adhesives already attached and 25 blotting papers that are infused with a translucent powder that absorbs oil without ruining your makeup. This is great for quick touch ups and leaves a slight matte look to your skin while also looking nice and refreshed. You can find the here. The natural makeup look is definitely my absolute favorite trend by far. And the great thing about it is that I highly doubt that this trend will be dying out anytime soon! 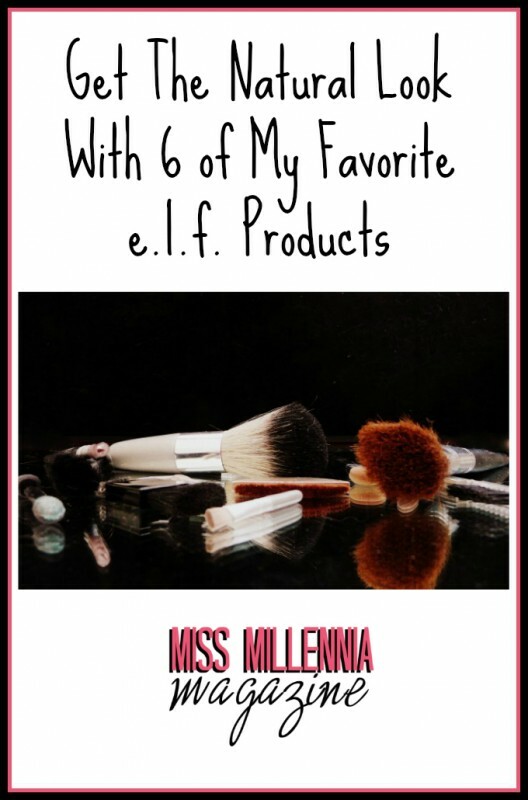 Try out one or all of my favorite e.l.f. products and let me know what you think about them in the comments section below. Thanks for reading!